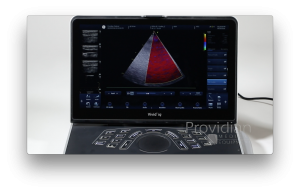 As the most powerful portable cardiovascular ultrasound machine on the market, the Vivid iq has many features that are found on a console machine. Part 4 of our Vivid iq training shows how to use Doppler, as well as how to activate the various advanced quantification packages. Links to all the videos in this series can be found below the video. For more training videos, check out our Ultrasound Machine Training Library. Interested in purchasing a Vivid iq? Call us today at 877-661-8224. E-mail us via the form below to receive a product quote.